This Saturday and Sunday, 18 and 19 July 2015, the annual Lambeth Country Show takes place in Brockwell Park, SE24. As usual we will have a stall at which we will be talking to people about cycling and giving out leaflets and maps. We will be in the charities section of the show - come and say hello and pick up information on cycling in Lambeth as well as cycle maps and other information. The Lambeth Country Show is the largest summer event in South London with around 180,000 people attending over the weekend. As well as charity stalls you will find live music, food, drink, farm animals, a flower show and displays such as duck herding, camel racing and owls. More information on the Lambeth Country show website. 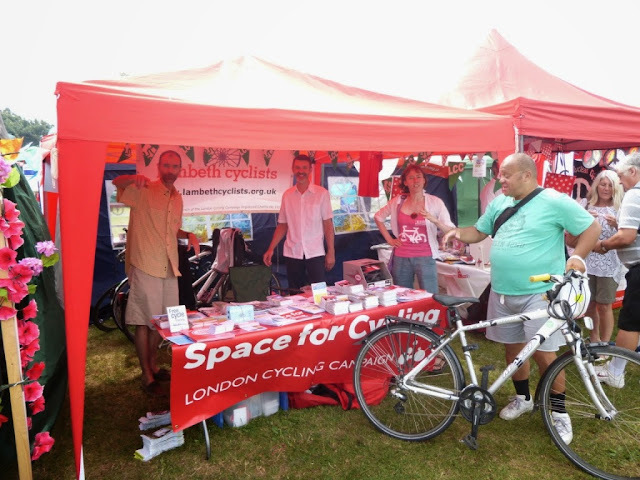 Could you help us out by spending an hour or two on our stall promoting cycling in Lambeth? We need volunteers from 12 - 5 pm on both days. The weather forecast for the weekend is good and its always a fun day. If you are interested in volunteering please contact us. A new initiative at the show this year is a Bike Market. You will be able to buy quality second-hand bikes for all ages which have been checked by bike mechanics. This will also be an opportunity to sell any of your unwanted bikes - bring them along and they will be serviced and then sold at the market. More information on the Lambeth website. Secure cycle parking is available at the Show -look out for the signs.